Doctor Who THE STONE ROSE Review | Warped Factor - Words in the Key of Geek. As David Tennant joins the rosters of Big Finish Doctors, Andrew East looks back at an earlier audio adventure for the Tenth Doctor. 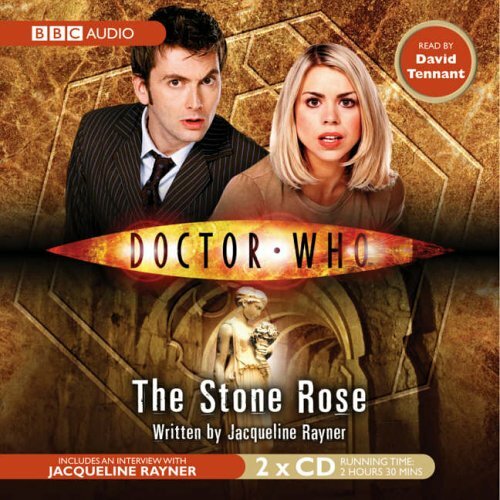 The Stone Rose (read by David Tennant) is, what I believe is termed, a New Series Adventure, featuring the Tenth Doctor and Rose. It also involves Mickey Smith and Jackie Tyler and, as such, fits quite well into its Series 2 position (presumably prior to School Reunion when Mickey joins the TARDIS crew). The story see Mickey volunteering at the British Museum, taking children on tours, and discovering a Roman statue that is the spitting image of Rose. The Doctor and Rose take a trip back to ancient Rome to unearth the truth behind the statue and discover that a sculptor called Ursus is actually turning people to stone. Aided by Gracilus, a rich man who’s son has become one of Ursus’ victims, and a slave girl called Vanessa, they eventually discover the truth behind Ursus’ unusual gift. His power to turn people into stone has been given to him by a GENIE – a genetically created wish fulfilling creature from the 23rd century. It transpires that the creature (half dragon, half platypus) arrived in Rome with it’s creator’s daughter, Vanessa – who is really from the 23rd century but wished to find out what it was like to live in ancient Rome. After some timey wimey business involving a phial of, basically, magic potion which restores the stone people, the Doctor and Rose return to their own time, ensuring the statue discovered at the British Museum is still created – apparently by the Doctor, who manages (in between all the travelling around) to find time to be tutored by Michelangelo himself! I’ve always found audiobooks a bit of a struggle. One voice continually telling a story tends to allow my mind to wander and I do have to concentrate that little bit harder. I had listened to this once before, some time back, but when listening again for this review the only bit I remembered was the GENIE and Rose in the white limbo. I’d even forgotten the fact that someone was actually turning people into stone, which shows how well it stuck in my head! That’s not to say it isn’t a good story, though. It is fun, if a little silly. The idea of a wish-fulfilling dragon-like creature is very Five Children and It and, as a consequence, gives this story a far more magical feel than would normally be tolerated in the series. It’s the sort of tale that would have Doctor Who’s more strident critics up in arms were it the plot of an actual televised episode, being far more fantasy than even science fantasy or science fiction. The ‘science’ aspect of the GENIE doesn’t really hold any water and the constant tripping around in time feels like a precursor to the Moffat eras timey-wimey fuelled get outs (a la the Doctor’s escape from the Pandorica). The magical silliness is further enhanced by David Tennant’s reading – a plethora of silly voices bring to life the characters and the fact that he makes the GENIE sound like a magical creature from a children’s story doesn’t really help matters. However, it’s entertaining enough and the trip to Rome does include some good historical details such as the Coliseum originally being called the Flavian Amphitheatre, and the references to the construction of Hadrian’s Wall (which alerts the Doctor to Vanessa’s anachronisticity (is that a word?)). The Doctor finally gets to experience a proper ‘thrown to the lions’ scenario, along with gladiators, bears and leopards; something he didn’t even manage on his trip to Rome in The Romans in 64AD. There is also a short reference to the Doctor knowing the best marble merchants in the area which were it not for the fact this story was written long before the Doctor met marble merchant Caecilius in The Fires of Pompeii, would have been a lovely little nod to that story! Aside from this we also get the obligatory “slavery is bad” rhetoric, with the Doctor pointedly telling Gracilus at the close of the story that Vanessa won’t be returning to his service. The Stone Rose is fun, if silly, and David Tennant’s reading matches the tone of the story perfectly.